Christmas graphic tops have become so popular over the last few years and let me just say…I ain’t hatin’ it! I think they are so cute and especially fun during the Christmas season! They have come out with some of the cutest sayings and I truly think they can be dressed up or down! I have found several of my favorite ones online for you guys and think you will love them! You can click directly on the top and it will take you to the retailer! What says Christmas better than a cute comfy top that makes everyone smile?! 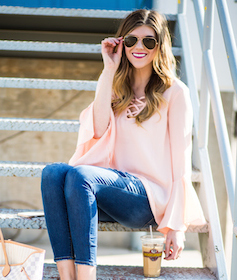 You can now shop all of these tops by simply clicking on your favorite! I think my favorite is the MERRY AF sweatshirt! I can just see it paired with these leggings, these boots, and this beanie! AHHH, the perfect Christmas outfit! What Christmas graphic top is your favorite? Will you be ordering any of these?? I know I sure will! Check out my holiday Christmas guides here!